Unsafe On Any Campus? heads to Barnes & Noble! 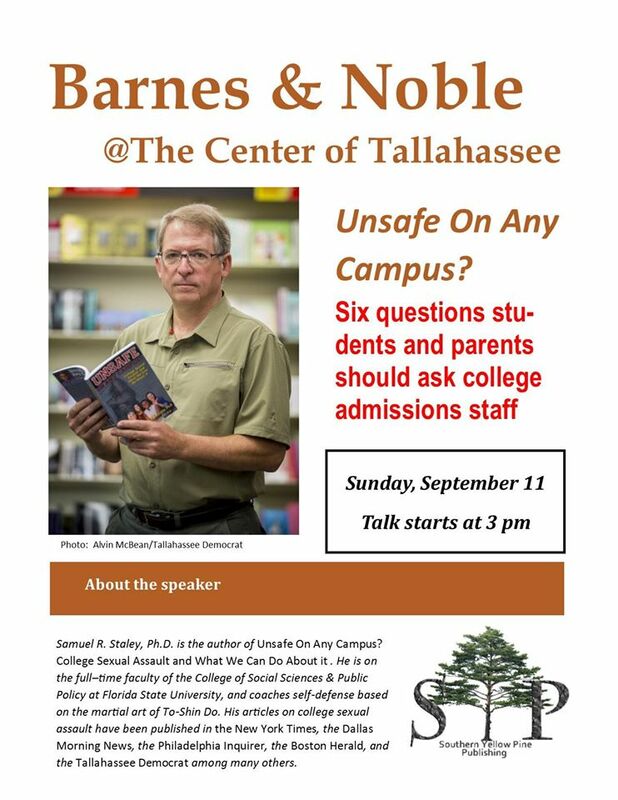 Barnes & Noble has accepted Unsafe On Any Campus? into their system. Unsafe On Any Campus? has been accepted into the Barnes & Noble system, which greatly facilitates my ability to organize and schedule book events at these stores. In fact, bricks and mortar book stores are great venues for the kinds of public information and education events I want to organize around my book signings. All a local Barnes & Noble manager has to do is check their system, and they will find Unsafe On Any Campus? This means they do not have to get corporate approval to host an event, and they can order the books directly through their distributors. The first event will be at Barnes & Noble in Tallahassee, Sunday, September 11, 2016. I will start off with a brief talk at 3 pm on “Six Questions Parents and Students Should Ask College Admissions Staff About College Sexual Assault.” I’ll then open up the floor to Q&A and discussion. Of course, I’ll also be available to sign books! I hope this is the beginning of a new wrinkle on a national marketing campaign! If you want to support my effort, here’s the link to the Barnes & Noble order page for Unsafe On Any Campus? College Sexual Assault and What We Can Do About It. This entry was posted in Book Signings, Marketing, Unsafe On Any Campus and tagged Barnes & Noble, book signings, Unsafe On Any Campus on September 6, 2016 by SR Staley.